Microsoft’s PR team has helpfully summarised many of the announcements at the Ignite event, kicking off today in Orlando. I count 82, but you might make it fewer or many more, depending on what you call an announcement. And that is not including the business apps announcements made at the end of last week, most notably the arrival of the HoloLens-based Remote Assist in Dynamics 365. Not all announcements are equal. Some, like the release of Windows Server 2019, are significant but not really news; we knew it was coming around now, and the preview has been around for ages. Others, like larger Azure managed disk sizes (8, 16 and 32TB) are cool if that is what you need, but hardly surprising; the specification of available cloud infrastructure is continually being enhanced. Note that this post is based on what Microsoft chose to reveal to press ahead of the event, and there is more to come. Microsoft’s journey from being an on-premises company, to being a service provider, is not yet complete, but it is absolutely the focus of almost everything new. I will never forget an attendee at a previous Microsoft event a few years back telling me, “this cloud stuff is not relevant to us. We have our own datacenter.” I cannot help wondering how much Office 365 and/or Azure that person’s company is consuming now. Of course on-premises servers and applications remain important to Microsoft’s business, but it is hard to swim against the tide. Ploughing through 82 announcements would be dull for me to write and you to read, so here are some things that caught my eye, aside from those already mentioned. 1. Azure confidential computing in public preview. A new series of VMs using Intel’s SGX technology lets you process data in a hardware-enforced trusted execution environment. 2. Cortana Skills Kit for Enterprise. Currently invite-only, this is intended to make it easier to write business bots “to improve workforce productivity” – or perhaps, an effort to reduce the burden on support staff. I recall examples of using conversational bots for common employee queries like “how much holiday allowance do I have remining, and which days can I take off?”. As to what is really new here, I have yet to discover. 3. A Python SDK for Azure Machine Learning. Important given the popularity of Python in this space. 4. Unified search in Microsoft 365. Is anyone using Delve? Maybe not, which is why Microsoft is bringing a search box to every cloud application, which is meant to use Microsoft Graph, AI and Bing to search across all company data and bring you personalized results. Great if it works. 5. Azure Digital Twins. With public preview promised on October 15, this lets you build “comprehensive digital models of any physical environment”. Once you have the model, there are all sorts of possibilities for optimization and safe experimentation. 6. Azure IoT Hub to support the Android Things platform via the Java SDK. Another example of Microsoft saying, use what you want, we can support it. 7. 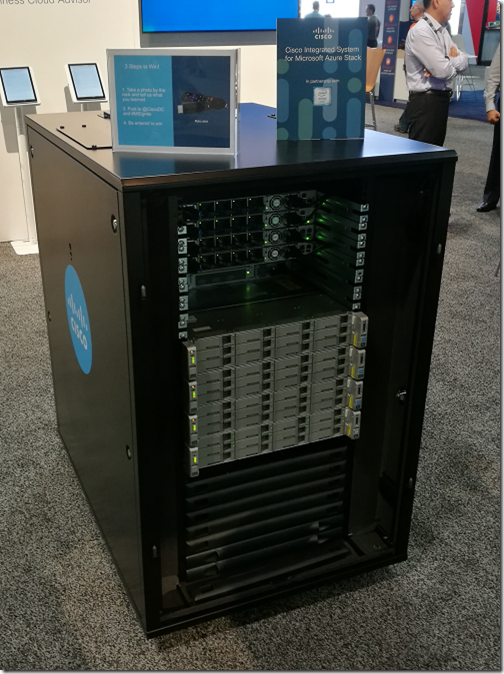 Azure Data Box Edge appliance. The assumption behind Edge computing is both simple and compelling: it pays to process data locally so you can send only summary or interesting data to the cloud. 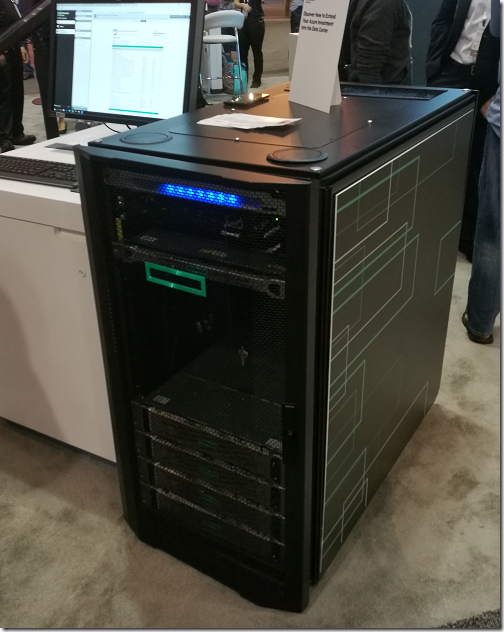 This appliance is intended to simplify both local processing and data transfer to Azure. 8. Azure Functions 2.0 hits general availability. Supports .NET Core, Python. 9. Helm repositories in Azure Container Registry, now in public preview. 10 Windows Autopilot support extended to existing devices. This auto-configuration feature previously only worked with new devices. Requires Windows 10 October Update, or automated upgrade to this. 1. LinkedIn integration with Office 365. Co-author documents and send emails to LinkedIn contacts, and surface LinkedIn information in meeting invites. 2. Office Ideas. Suggestions as you work to improve the design of your document, or suggest trends and charts in Excel. Sounds good but I am sceptical. 3. OneDrive for Mac gets Files on Demand. A smarter way to use cloud storage, downloading only files that you need but showing all available documents in Mac Finder. 4. New staff scheduling tools in Teams. Coming in October. ”With new schedule management tools, managers can now create and share schedules,employees can easily swap shifts, request time off, and see who else is working.” Maybe not a big deal in itself, but Teams is huge as I previously noted. Apparently the largest Team is over 100,000 strong now and there are 50+ out there with 10,000 or more members. Preview by the end of 2018 is targeted. Virtual Windows desktops are already available on Azure, via partnership with Citrix or VMWare Horizon, but Microsoft has held back from what is technically feasible in order to protect its Windows and Office licensing income. By the time you have paid for licenses for Windows Server, Remote Access per user, Office per user, and whatever third-party technology you are using, it gets expensive. This is mainly about licensing rather than technology, since supporting multiple users running Office applications is now a light load for a modern server. 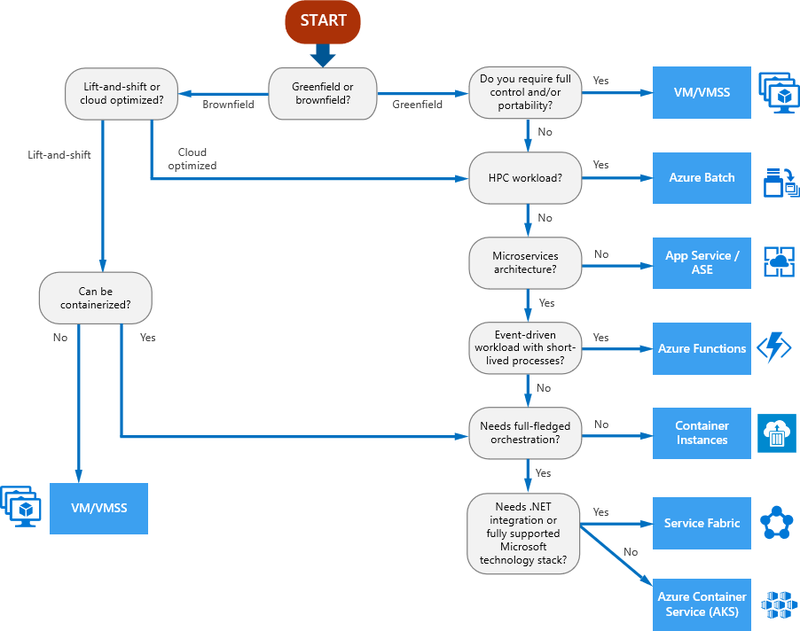 If Microsoft truly gets behind a pure first-party solution for hosted desktops on Azure at a reasonable cost, the take up would be considerable since it is a handy solution for many scenarios. This would not please its partners though, nor the many hosting companies which offer this. On the other hand, Microsoft may want to compete more vigorously with Amazon Web Services and its Workspaces offering. Workspaces is still Windows, but of course integrates nicely with AWS solutions for storage, directory, email and so on, so there is a strategic aspect here. Update: A little more on Microsoft Virtual Desktop here. At Microsoft’s Build event in May this year I interviewed Dharma Shukla, Technical Fellow for the Azure Data group, about Cosmos DB. I enjoyed the interview but have not made use of the material until now, so even though Build was some time back I wanted to share some of his remarks. 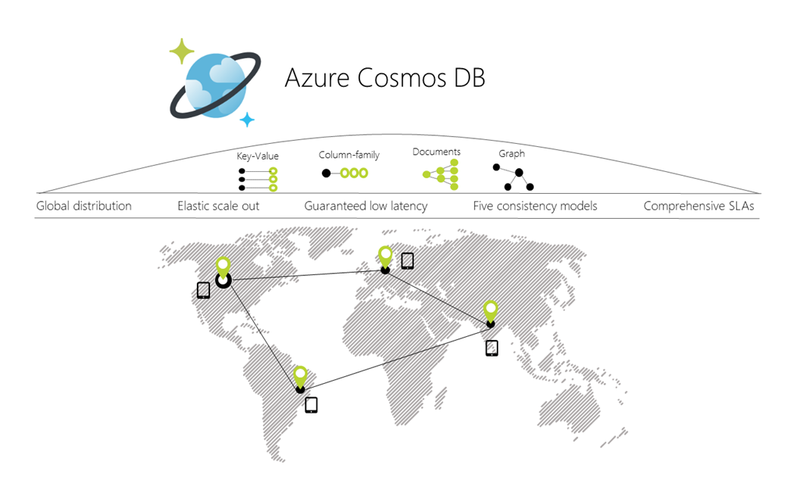 Cosmos DB is Microsoft’s cloud-hosted NoSQL database. It began life as DocumentDB, and was re-launched as Cosmos DB at Build 2017. There are several things I did not appreciate at the time. One was how much use Microsoft itself makes of Cosmos DB, including for Azure Active Directory, the identity provider behind Office 365. Another was how low Cosmos DB sits in the overall Azure cloud system. It is a foundational piece, as Shukla explains below. There were several Cosmos DB announcements at Build. What’s new? “Multi-master is one of the capabilities that we announced yesterday. It allows developers to scale writes all around the world. Until yesterday Cosmos DB allowed you to scale writes in a single region but reads all around the world. Now we allow developers to scale reads and writes homogeneously all round the world. This is a huge deal for apps like IoT, connected cars, sensors, wearables. The amount of writes are far more than the amount of reads. “The second thing is that now you get single-digit millisecond write latencies at the 99 percentile not just in one region. “And the third piece is that what falls out of this high availability. The window of failover, the time it takes to failover from one region when a disaster happens, to the other, has shrunk significantly. “It’s the only system I know of that has married the high consistency models that we have exposed with multi-master capability as well. It had to reach a certain level of maturity, testing it with first-party Microsoft applications at scale and then with a select set of external customers. That’s why it took us a long time. Does Cosmos DB work on Azure Stack? Have customers asked for any additional APIs into Cosmos DB? Can you tell me anything about how you’ve implemented Cosmos DB? I know you use Service Fabric. Do you use other Azure services? “We have dedicated clusters of compute machines. Cosmos DB is a Ring 0 service. So it’s there any time Azure opens a new region, Cosmos DB clusters have provision by default. Just like compute, storage, Cosmos DB is also one of the Ring 0 services which is the bottommost. Azure Active Directory for example depends on Cosmos DB. So Cosmos DB cannot take a dependency on Active Directory. “The dependency that we have is our own clusters and machines, on which we put Service Fabric. For deployment of Cosmos DB code itself, we use Service Fabric. For some of the load balancing aspects we use Service Fabric. The partition management, global distribution, replication, is our own. So Cosmos DB is layered on top of Service Fabric, it is a Service Fabric application. But then it takes over. Once the Cosmos DB bits are laid out on the machine then its replication and partition management and distribution pieces take over. So that is the layering. “Other than that there is no dependency on Azure. And that is why one of the salient aspects of this is that you can take the system and host it easily in places like Azure Stack. The dependencies are very small. So when you say it is not currently in Azure Stack, it’s there underneath, but you haven’t surfaced it? Microsoft itself is using Cosmos DB. How far back does this go? Azure AD is quite old now. Was it always on Cosmos DB / DocumentDB? “Over the years Office 365, Xbox, Skype, Bing, and more and more of Azure services, have started moving. Now it has almost become ubiquitous. Because it’s at the bottom of the stack, taking a dependency on it is very easy. Do you think your customers are good at making the right choices over which database technology to use? I do pick up some uncertainty about this. “We are working on making sure that we provide that clarity. Postgres and MySQL and MariaDB and SQL Server, Azure SQL and elastic pools, managed instances, there is a whole slew of relational offerings. Then we have Cosmos DB and then lots of analytical offerings as well. “If you are a relational app, and if you are using a relational database, and you are migrating from on-prem to Azure, then we recommend the relational family. It comes with this fundamental scale caveat which is that up to 4TB. Most of those customers are settled because they have designed the app around those sorts of scalability limitations. “A subset of those customers, and a whole bunch of brand new customers, are willing to re-write the app. They know that that they want to come to cloud for scale. So then we pitch Cosmos DB. “Then there are customers who want to do massive scale offline analytical processing. So there is, Databricks, Spark, HD Insight, and that set of services. Any numbers to flesh out the idea that this is a fast-growing service for Microsoft? One of the best features of Microsoft Build, possibly the best, is the exhibition. Microsoft sets up stands for each of its product teams, and the staff there generally include the people who actually build that product, making this a great way to interact with them and get authoritative answers to questions. I interviewed several executives at Build and asked a couple of times, how can your customers work out which Azure service is the best fit for what they need? It is not a trivial question, now that there are so many different services which overlapping functionality. It is critically important. You can waste a large amount of money and cause unnecessary frustration by selecting the wrong services. None of these executives mentioned that Microsoft has a rather good guide for exactly this question. It is called the Azure Architecture Center and I discovered it on the show floor. 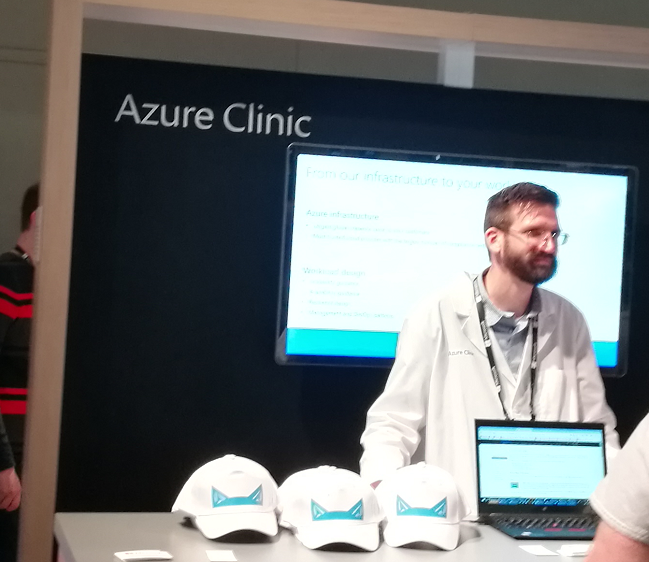 The stand was called Azure Clinic and I told the guy his costume reminded me of Dr GUI. He was too young to remember this MSDN character of old but another guy on the stand overheard and said it brought back bad memories! Which Azure Stack is right for you? I went in search of Azure Stack at Microsoft’s Ignite event. I found a few in the Expo. It is now shipping and the Lenovo guy said they had sold a dozen or so already. Why Azure Stack? Microsoft’s point is that it lets you run exactly the same application on premises or in its public cloud. The other thing is that although you have some maintenance burden – power, cooling, replacing bits if they break – it is pretty minimal; the configuration is done for you. 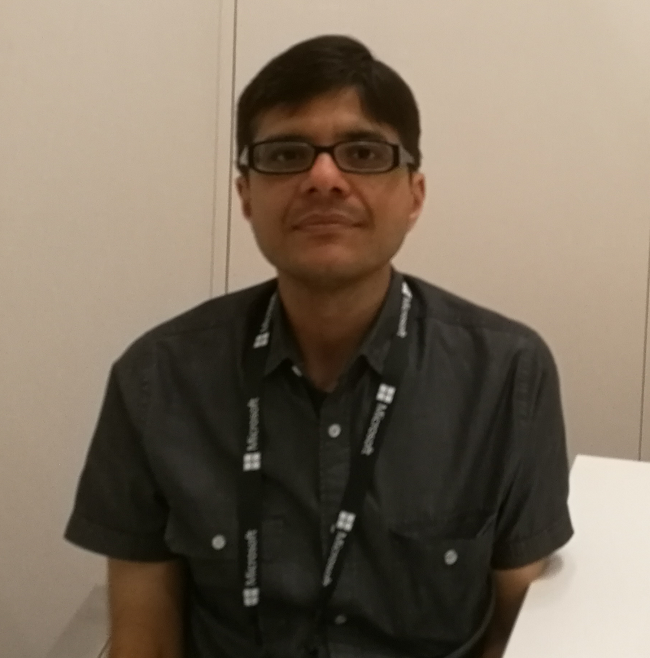 I talked to one of the vendors about the impact on VMware, which dominates the market for virtualisation in the datacentre. My sense in the VMware vs Hyper-V debate is that VMware still has an edge, particularly in its management tools but Hyper-V is solid (aside from a few issues with Cluster Shared Volumes) and a lot less expensive. Azure Stack is Hyper-V of course; and the point the vendor made was that configuring an equivalent private cloud with VMware would be possible but hugely more expensive, not only in license cost but also in the skill needed to set it all up correctly. So I think this is a smart move from Microsoft. Why no Dell? They told me it was damaged in transit. Shame. 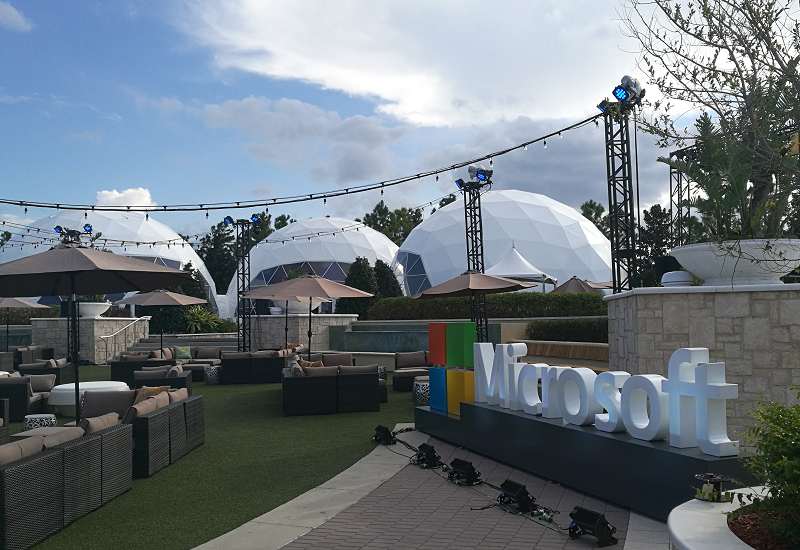 Microsoft Ignite: where next for Microsoft’s cloud? The Facebook of business? Microsoft has futuristic domes as part of its Envision event, running alongside Ignite here in Orlando. Ignite is the company’s main technical event of the year, focusing mainly on IT Pros but embracing pretty much the whole spectrum of Microsoft’s products and services (maybe not much Xbox!). 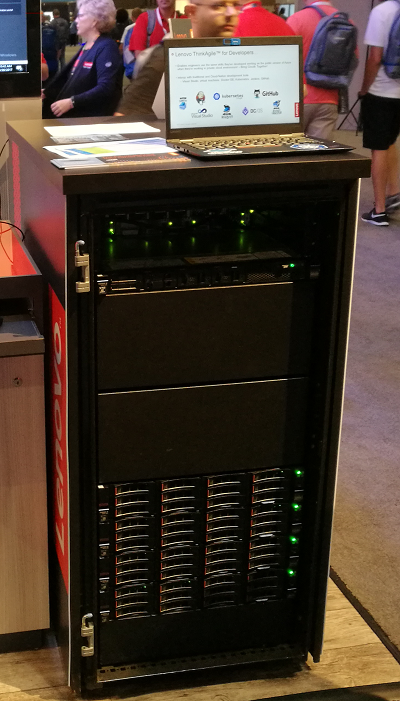 With the decline of the PC and retreat from mobile, and a server guy at the helm, the company’s focus has shifted towards cloud and enterprise, making Ignite all the more important. This year sees around 25-30,000 attendees according to a quick estimate from one of the PRs here; a little bigger than last year’s event in Atlanta. Microsoft will present itself as an innovative company doing great things in the cloud but the truth is more complex, much though I respect the extent to which the business has been transformed. This is a company with a huge amount of legacy technology, designed for a previous era, and its challenge has been, and still is, how to make that a springboard for moving to a new way of working as opposed to a selling opportunity for cloud-born competitors, primarily Amazon Web Services (AWS) and Google, but also the likes of Salesforce and Dropbox. If there is one product that has saved Microsoft, it is probably Exchange, always a solid email server and basic collaboration tool. Hosted Exchange is the heart of Office 365 (and BPOS before it), making it an easy sell to numerous businesses already equipped with Office and Outlook. Email servers are horrible things to manage, so hosted has great appeal, and it has driven huge uptake. A side-effect is that it has kept customers using Office and to some extent Windows. A further side-effect is that it has migrated businesses onto Azure Active Directory, the directory behind Exchange Online. Alongside Office 365, the Azure cloud has matured into a credible competitor to AWS. There are still shortcomings (a few of which you can expect to be addressed by announcements here at Ignite), but it works, providing the company with the opportunity to upsell customers from users of cloud infrastructure to consumers of cloud services, such as Azure IoT, a suite of tools for gathering and analysing data. The weakness of Microsoft’s cloud efforts has been the moving parts between hosted services and Windows PCs, and legacy pieces that do not work as you would expect. OneDrive has been a persistent annoyance, with issues over reliable document sync and limitations over things like the number of documents in a folder and the total length of a path. And where are my Exchange Public Folders, or any shared folders, in Outlook for IoS and Android? And why does a PC installation of Office now and again collapse with activation or other issues, so that the only solution is removal and reinstall? At Ignite we will not hear of such things. Instead, Microsoft will be presenting its vision of AI-informed business collaboration. Think “Facebook of business”, powered by the “Microsoft graph”, the sum of data held on each user and their files and activity, now combined with LinkedIn. The possibilities for better-informed business activity, and systems that know what you need before you ask, are enticing. Open questions are how well it will work, and old issues of privacy and surveillance. Such things also can only work if businesses do in fact commit more of their data to Microsoft’s cloud. The business case for this is by no means as simple as the company would have us think. 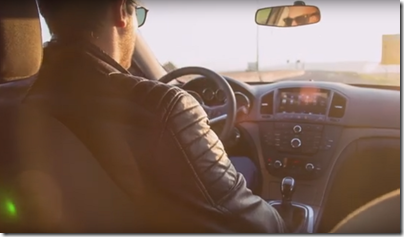 Microsoft has announced the Connected Vehicle Platform, at the CES event under way in Las Vegas. The company is not new to in-car systems, but its track record is disappointing. It used to be all about Windows Embedded, using Windows CE to make a vehicle into a smart device. Ford was Microsoft’s biggest partner. It built Ford SYNC on the platform and in 2012 announced five years of partnership and 5 million SYNC-enabled vehicles. However in 2014 Ford announced SYNC 3 with no mention of Microsoft – because SYNC 3 uses Blackberry’s QNX. What went wrong? There’s a 2014 analysis from Bill Howard that offers a few clues. The bit that chimes with me is that Microsoft was too slow in updating the system. The overall Windows story over the last 10 years is convoluted to say the least, with many changes to the platform and disruptive (in a bad way) strategy shifts. The same factor is a large part of why Windows Phone failed. Cortana also gets a mention. We may think of Cortana as a virtual assistant, but what this means is a user interface to intelligent services. There is big competition for all this of course, with Google, Amazon and Apple also in this space. There is also politics involved. If you read Howard’s analysis linked above, note that he mentions how the auto companies dislike restrictions such as Google insisting that you can’t have Google Search unless you also use Google Maps (I have no idea if this is still the case). There is a tension here. In-car systems are an important value-add for customers and critical to marketing vehicles, but the auto companies do not want their vehicles to become just another channel for big data-gathering companies like Google and Amazon. Another point of interest is how smartphones interact with your car. If you want a simple and integrated experience, you can just dock your phone and use it for navigation, communication and entertainment – three key areas for in-car systems. On the other hand, a docked phone will not have the built-in screen and control of vehicle features that an embedded system can offer.